Guilhermina de Moraes Sarmento was the third daughter of Anselmo Evaristo de Moraes Sarmento, a tradesman from Aveiro, and of his wife D. Rita de Cássia de Oliveira Moraes, who was born in Porto. The family lived in Rua do Almada where Guilhermina was born on the 4th July 1870. She was baptized a few days later, on the 17th July, in the Parish Church of Nossa Senhora da Vitória in Porto, by Father António Ribeiro dos Santos. Her godparents were Doctor Joaquim Teófilo Braga, also living in Rua do Almada and, by proxy, D. Emília Ludovina de Moraes Sarmento, living in Aveiro. Guilhermina spent her childhood and youth in Porto. Besides one brother, she had three sisters of about the same age: Laurinda, Aurélia and Rita, born in 1867, 1869 and 1872, respectively. While her mother was occupied educating their five children, her father worked as a tradesman at the printing company "Imprensa Portuguesa" and as a journalist, editing the periodicals "Gazeta Literária do Porto" and "A Actualidade", and later "A Ideia Nova – diário democrático". Guilhermina’s moral and ethical upbringing was strongly influenced by her father’s open-mindedness, a quality that stemmed from being a descendant of the Moraes de Aveiro, a family persecuted during the absolutist reign of D. Miguel. The family’s influence has also contributed to stress the importance of education as grounds for personal and social promotion. In addition to the liberal values held by the family, Guilhermina was likewise influenced by those who engaged her father for professional reasons or as friends. Among these were such celebrated individuals as Oliveira Martins, Ramalho Ortigão, Camilo Castelo Branco, Antero de Quental and Teófilo Braga. The house of the Moraes Sarmento was a privileged place for the circulation of liberal principles and the ideas of the time, when the establishment of a democratic culture and mentality was a key concern for the country. Alongside this atmosphere, the fact that the five brothers and sisters got their diplomas in higher education is also an important issue. Both Guilhermina and her sisters got their diplomas in Porto before the turn of the 19th century. When she was 17 years old, Guilhermina enrolled in Polytechnic Academy of Porto together with her younger sister Rita and followed her older sisters’ example of attending the mandatory subjects to enter Medical-Surgical School of Porto. Soon, in her first academic year (1887-1888), the student showed her expertise when she concluded, with distinction, the subjects of General Inorganic Chemistry, Botany and General Physics, earning a praise from the School Board for the latter. In the following year, she concluded Organic and Analytical Chemistry and Zoology, with a mark of 15 on both, granting her a new academic distinction. On 15th October 1889, Guilhermina enrolled in Medical-Surgical School of Porto, where her older sisters were concluding their courses. During her first year, from 1889 to 1890, she was approved in the subjects of Anatomy, Phisiology, Pharmacology or Medical Expertise, Pathological Anatomy and General Pathology. Despite the death of her mother in November 1892, while Guilhermina was in the 4th year of her course, she was successful in the exams for External Pathology and Therapeutics, Internal Pathology and Operative Medicine. Finally, during her last year she was successful in Medical Practice, Surgical Practice, Obstetrics or Parturition, and Hygiene and Forensic Medicine. By the time she took the last exam, on 11th July 1894, she was the only woman among 28 graduates. Guilhermina then presented the "Ato Grande" on 6th October 1894, with a dissertation entitled A Dilatação do Estômago (Dilation of the Stomach), published in the same year by the Portuguese Press. The Dissertation was supervised by Dr. Agostinho do Souto and Doctors António Joaquim de Moraes Caldas, Pereira Pimenta, Plácido da Costa and Maximiano Lemos were the examiners. Thus, Guilhermina de Moraes Sarmento became the fourth doctor graduating from the Medical-Surgical School of Porto. The Dissertation was first dedicated to her father and to the memory of her mother, then to her brothers and sisters, and subsequently to her godfather Teófilo Braga and his wife D. Maria do Carmo Xavier Braga, to her great-uncle Jerónimo de Moraes Sarmento, to her cousin Dr. António Augusto Soares de Sousa Cirne and to the memory of Dr. António Vitorino da Mota. She also mentioned her professors and the president of the jury. 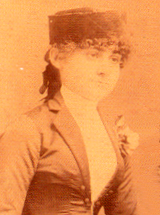 There aren’t enough data to trace the personal and professional path of Guilhermina de Moraes Sarmento, only that she and her father were witnesses at her sister Rita’s wedding in late 1898, with the following inscription: «Guilhermina de Moraes Sarmento, doctor, living in Rua do Almada».